This exercise works latissimus dorsi, teres major, biceps brachii, brachialis and a little bit trapezius (middle and lower portion), rhomboid and pectoralis major. 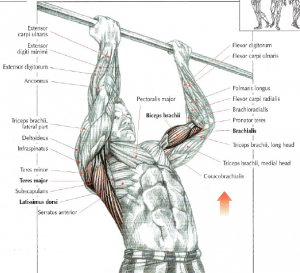 This exercise can be included in a program specific to the arms. If you have difficulty to lift yourself with your bodyweight, you can do this exercise with the cable machine « lat pulldowns ». Share this article you think it can help someone you know. Thank you.